Donald Trump and Kim Jong-un talking in Capella Hotel, during the Singapore summit. The most significant achievement of Donald Trump’s North Korea policy, per Donald Trump, is that North Korea is no longer developing nuclear weapons. He has repeatedly made that claim, as has been documented in prior TNB articles. He has continued to make the claim even as US and foreign intelligence services have indicated it may not be true. Now, North Korea is officially admitting that their stated dedication to denuclearization is negotiable. 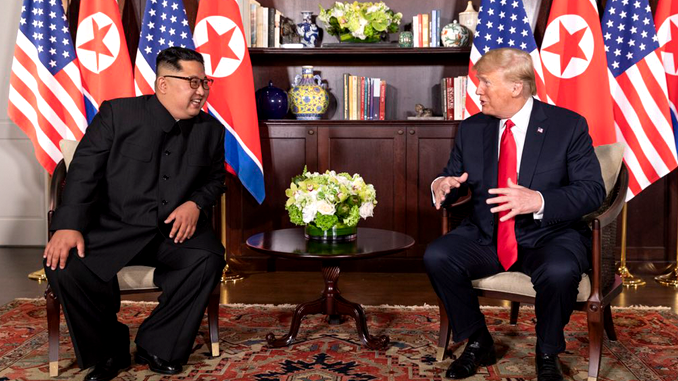 (I)t accused Washington of derailing commitments made by North Korean leader Kim Jong Un and President Donald Trump at their June summit in Singapore to work toward a nuclear-free Korean Peninsula. North Korea’s reversals on such policies are not new; in fact, they are a standard procedure in North Korean diplomacy. This is one of the reasons why most experts and laypersons alike warned against high level summit talks without preconditions or making concessions to North Korea without significant concessions in return. The difference between the usual reversals by North Korea and the one threatened now is that North Korea has been elevated onto the international stage as a relative equal by the summit talks and normalized by the US-backed reconciliation efforts between North and South Korea. Instead of North Korea being alone when they are making these decisions, they are seeing support from sources as varied as South Korea, which has recently discussed easing sanctions on its own before facing a sharp rebuke from the President; and Russia, which has recently asked the Security Council in the United Nations to discuss the sanctions on North Korea.